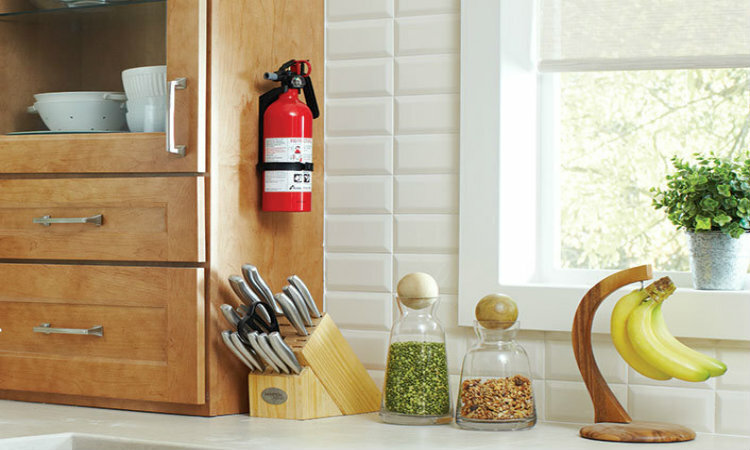 Whether your home is a three-story, a skyline-grazing apartment or an RV on wheels, you need at least one fire extinguisher for it. But, if you don’t have the right one, or you haven’t checked it recently, you may have a false sense of security rather than a fire-fighting device. There are extinguishers for each type of fire. Class A: ordinary combustibles, such as wood; Class B: flammable liquids or gasses, such as gasoline or propane; Class C: energized electrical equipment like appliances; Class D: combustible metals; and Class K: cooking oils and greases. An extinguisher that isn’t rated for the fire you’re trying to fight likely won’t help. Multipurpose extinguishers are widely available. Typically rated for Class A, B and C fires, they are good for most living areas and also work on small grease fires. You need at least one for each level of your home, and one in the garage is a good idea, too. Store them in an accessible area and inspect them regularly for rust and other damage. Also, follow any maintenance instructions included with the device. For example, some need to be shaken regularly. Remember “P.A.S.S.” when you use your extinguisher’s base. Pull the safety pin from the handle. Aim the nozzle at the base of the fire. Squeeze the lever. Sweep the nozzle back and forth. And, always keep your back to an exit when fighting a fire. You need to be able to escape quickly if necessary. Even more important than knowing how to use your fire extinguisher is knowing when not to use it. If you’d be putting yourself at risk trying to fight a fire, leave the area immediately. You should already have a family fire escape plan in place, so don’t hesitate to use it if there’s any question about your safety. After all, your life is irreplaceable. Your insurance; however, can help you rebuild your home and replace your belongings. If you’d like to check up on your coverage, give us a call today.